Nobody may believe this, but EVERY film could be remade. There are many reasons for this. Sometimes it is done to improve on the previous film. Other times it is done to update a film from years past. There have no doubt been times that something was remade simply because that was a way to squeeze more money out of the property. And if Hollywood continues to employ this trend, sooner or later, every movie, no matter how classic, will probably get resurrected in some way shape or form. No matter how much fans don't want it to happen. It appears that some films have gotten remade simply because there wasn't a good case against remaking it. If you're a studio head then the numbers make a lot of sense. People know the property, the characters, the story, etc. Nobody is going to be 'literally' hurt by remaking said film, the original will always be there is the argument. And heck, this could generate more sales for the original in one of the ancillary markets. Today's media culture is like nothing anybody has seen before. You have people getting famous by posting videos of themselves by themselves. Everybody with a Facebook or Instagram account is a brand in some way. There is a respect for films and media icons that have come before now, but there's also an entrenchment (some call it fear) of what today's pop culture is and continues to become. The internet is truly the great democracy machine of our time. If you want to find something, belong to something, or see if something exists, all you need is a search engine and an idea of what you want. It is because of the mash-ups and opinions that online culture has given us consumer overload. There's a million things to watch on TV, Netflix or any of the other content providers. Within this realm a space has been created where everything is pliable. Thing is, that hole needs to be filled. Fast. And what's the easiest way to pack it down? With something that needs very little original thought. Its fast food, the remake is the new frozen dinner. And while many fans will complain, they aren't going to stop coming anytime soon. Recently, superhero movies have shown that no matter what our attachment might be to a certain star or character, anything can be redone and we'll be okay. Just see Spider-Man's reboots or Eric Bana, Edward Norton or Mark Ruffalo's portrayal of the Hulk if you don't believe me. Watching a movie used to be a singular or group experience that was talked about amongst friends. Nowadays, it is an experience that we not only share with others but often comment on in real time. With this being the case for the resalable, foreseeable future, we give you "13 Movies That Hollywood will probably Remake". And we also examine how they might fare in 2016's world of popular/technical culture with a more positive outlook on what these reboots could be in the long run. 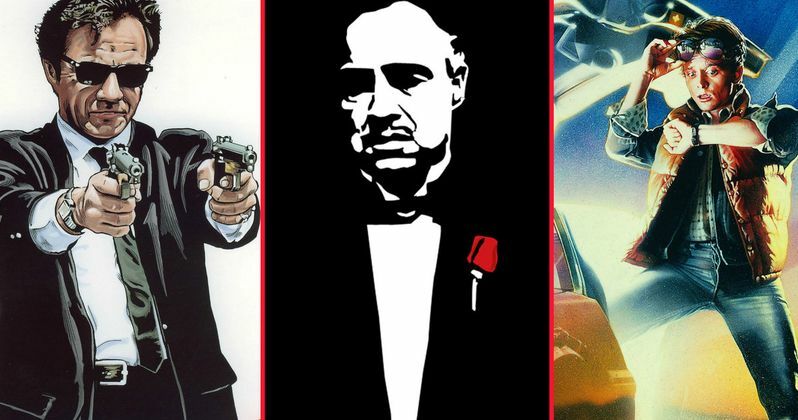 The first Godfather was made for $6 million and it grossed over 20 times that! Many lists rank this film as the best picture ever made. "Why mess with perfection?" You might ask? Because Hollywood can. And will. And does. No classic has stopped them before, just look at the upcoming Ben-Hur and Magnificent Seven remakes coming this year. The language of cinema has changed so much since the 1970s. Why not merge all three Godfather films into one? Speed up the pace and elongate the run time of the average film by 30 minutes? Cast a bunch of up and coming actors and possible set the film in the present day? It sounds overly audacious but if it worked, it would be groundbreaking and go a long way toward pushing the medium of film forward. Remaking the Godfather sounds blasphemous. But it could work. Though, it would defintely generate enough hate that it would probably bomb at the box office. This first offering from Wes Anderson barely received a theatrical release before exploding on the consciousness of home video. It was made for $7 million and it made little more than half a million. Why remake it? Would anybody care? The beauty of this film is that it could be redone and still retain the spark that made it so special. Sure, the comic aspect of the film would have to be handled delicately, but with the right director (might Anderson consider redoing arguably his best film? ), actors and work on the script, Bottle Rocket could ultimately prove to have a life in theaters of the Blazing Saddles variety. This film was part of that 1980s era of moviedom that was speaking to a generation. For a lot of people, myself included, I came to this film on VHS. And, like most of the people watching the film, I wanted to be the character of Les (Corey Haim), who was lucky enough to date the enchanting Mercedes (Heather Graham). It was this passion that forced Les to take his grandfather's Cadillac out for a night on the town, regardless of the fact that he didn't have a license. So, why not remake this in 2016? Imagine all the fun you could have with social media alone. There could be people every step of the way chronicling how the Cadillac gets abused. Perhaps his father, while checking Les' Facebook, gets wind of all these posts that are coming up in his son's feed? This says nothing of Les' best friend Dean. Initially played by Corey Feldman, perhaps we bring back the Felddog for a second go round. Sure, it might be odd to have him being be buds with a 16 year old, but this License to Drive remake could break a few rules and be just fine. Perhaps fans wouldn't be so against it?